George Oberteuffer was born on October 31st, 1878 in Philadelphia, Pennsylvania. He attended Princeton University and graduated in 1900. After graduation Oberteuffer enrolled in the Pennsylvania Academy of Fine Arts along with fellow artists Thomas Anschutz and William Merritt Chase. In 1901 the artist traveled to France where he remained until 1920 to study, paint, and teach art. In 1905 while attending the Académie Julian in Paris, Oberteuffer met his future wife Henriette Amiard. The two often exhibited their works together, and it seemed as though their relationship contributed to the success of their mutual careers. While in Paris, Oberteuffer became a member of the Sociétaire du Salon d'Automne as well as the Salon des Indépendents. He also is known to have taught at the Académie de la Grande Chaumière from 1919 until 1920. Oberteuffer and his wife returned to the United States in 1922, and he began a brief tenure as an instructor at the Pennsylvania Academy of Fine Arts. He then went on to teach at the Minneapolis Museum School of Art, the School of the Art Institute of Chicago as well as the Grand Central School of Art in New York. In 1939 Oberteuffer became a member of the National Academy of Design. In 1940 while George and Henriette Oberteuffer were living in Boston, The Vose Gallery held an Oberteuffer family exhibition that included the work of their son Karl. This exhibition would be the last one for George Oberteuffer. Sadly a short time afterwards while working on a large mural commission for the W.P.A. along with his wife, George Oberteuffer contracted pneumonia and died. Best known for his sketchy landscape views and inspired by his extended stay in France from 1901-1920 where he was influenced by the Luxembourg Gardens and the architecture of northern France, Oberteuffer developed a fresh and vigorous style, using a subdued color palette with agile brushstrokes that was influenced by French Impressionism. 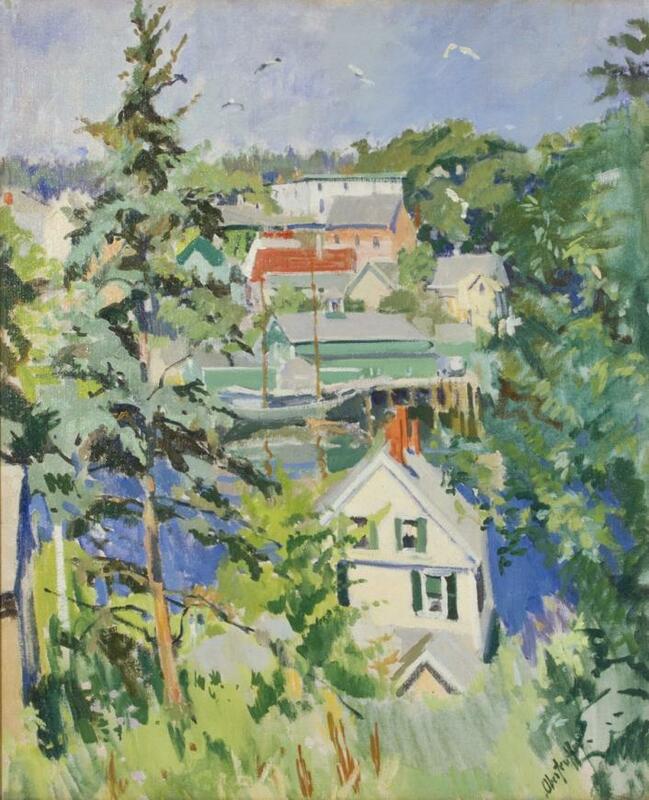 Boothbay Harbor from the Hill is a wonderful example of this style of painting and shows Oberteuffer's mastery of subtle color. 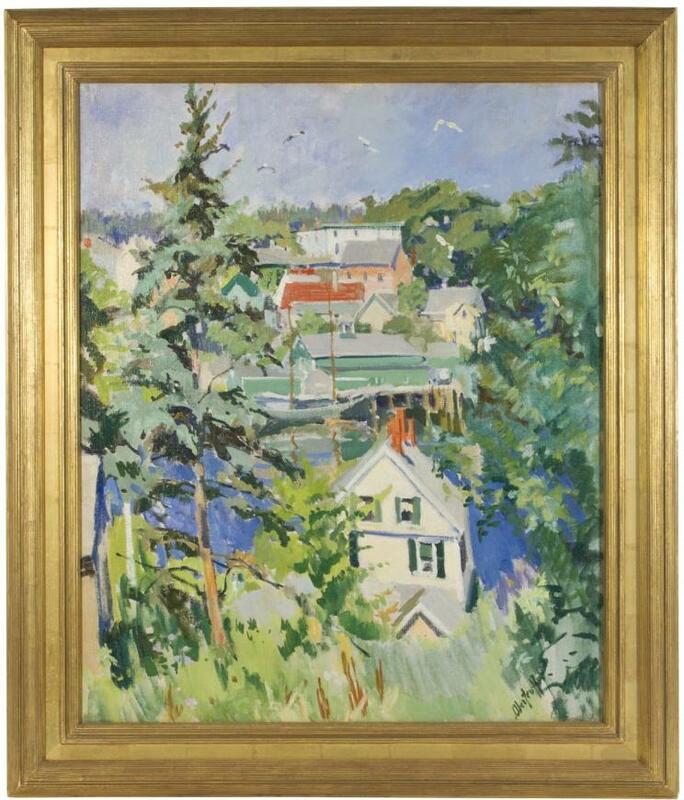 It is an added plus that Oberteuffer has specifically referenced a clearly identifiable locale- Boothbay Harbor- in his title and additionally denoted that the view was painted from the hillside, potentially capturing actual homes and buildings of the time. Oberteuffer is known to have painted numerous scenes of this popular summer destination for both artists and vacationers. A photograph of Boothbay Harbor below shows the scenic coastal town located northeast of Portland, Maine, as it looked in 1910. Oberteuffer probably painted this work sometime after his return to the United States from France in 1922. Oberteuffer's style was somewhat consistent and therefore it is difficult to date his works. Obertueffer loved nature with all her different seasons and "moods" and was known to paint exclusively out-of-doors in the country. First and foremost a colorist and painting "en plein air" Oberteuffer has painted the landscape in a spontaneous moment. The painting has a fresh and vigorous style and uses both vibrant color and rapid brushstrokes emblematic of French Impressionism, and yet it also has a distinctive modernist feel comparable to the work of such close artist friends as Fairfield Porter, John Marin and Arthur B. Carles. The red roof of a house in the distance coupled with the red chimney in the foreground provide a "punch" of color contrasted against the ubiquitous pine trees so closely associated with the state of Maine and the abundant green foliage of this potentially summer scene. Portraits and figural studies were not a usual part of Oberteuffer's repertoire. The lack of any trace of humanity in our example serves to underscore the calm stillness of the day and to confirm the feeling that this work is of a singular moment in time in this sleepy harbor town from the early part of the twentieth century.